I'm excited to share that I was featured as Author of the Day and Welcome to the Madhouse was featured as Book of the Day on ManyBooks.net! As part of this feature, I answered some questions and the interview is now up on their website. If you're interested in reading about some of my inspirations for Welcome to the Madhouse and the Dr. Grace Lord series, as well as a few of my other interests and why I write sci-fi, check out the interview by following the link below! From November 26 to December 20, 2015, enter to win one of ten free signed first edition paperback copies of Welcome to the Madhouse on Goodreads Giveaway. S.E. Sasaki will be attending the SFContario: Toronto's Autumn Science Fiction Convention, held at the Ramada Plaza Hotel in Toronto. S.E. Sasaki will be at the Conference on Canadian Content in Speculative Arts and Literature in Ottawa at the Ottawa Sheraton hotel. S.E. 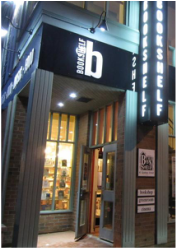 Sasaki will be having a book signing of Welcome to the Madhouse at The Bookshelf/eBar in Guelph, Ontario on Sunday October 18 from 5 to 8 pm. Book reading and discussion. All welcome!